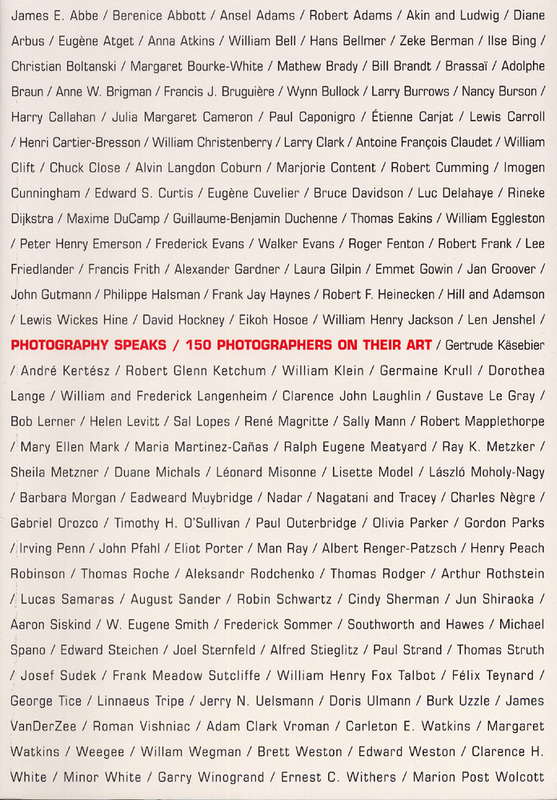 150 Photographers on Their Art. Aperture, New York, 2004. 320 pp., 150 four-color and duotone illustrations, 7x10". Produced in conjunction with the preeminent Chrysler Museum in Norfolk, Virginia, Aperture's essential series Photography Speaks will be reissued as one newly revised and expanded edition in the fall of 2004. From Matthew Brady to Cindy Sherman, more than 150 artists are represented in this new, combined volume spanning the entire history of the medium. This compendium contains biographical information and an original statement from each artist, accompanied by an example of their work. A favorite with photographers and requisite course material for many students, the discourse on art and artistry contained in this volume is of unprecedented scale, collecting the writing of such diverse photographers as William Henry Fox Talbot, Eugene Atget, Alfred Stieglitz, Lewis Hine, August Sander, Man Ray, Weegee, Robert Frank, Diane Arbus, Robert Heinecken, and Lucas Samaras. New additions include selections from Nadar, William Eggleston, Eikoh Hosoe, Gordon Parks, Manuel Alvarez Bravo, Christian Boltanski, and Rineke Dijkstra. The contributors expound on topics such as their method and intentions, the state of the arts, or the medium itself. Photography Speaks has been and will continue to be a vital reference source, an enduring testament to the art of photography and an engrossing text for artists and enthusiasts alike.